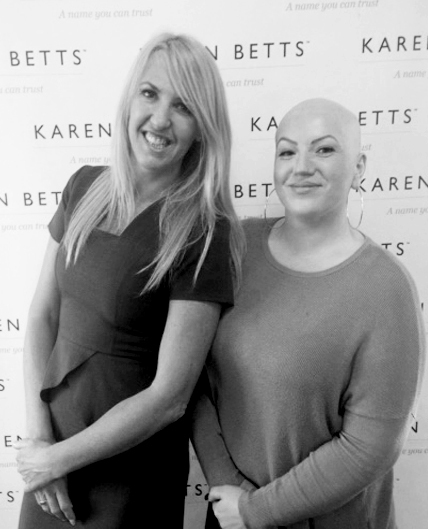 Karen Betts was the proud sponsor for Alopecia UK’s Big Weekend 2015 event this weekend. Karen offered free eyebrow guide templates to the 200 plus guests, as well as carrying out complimentary treatments for three lucky attendees, who had been pre-selected by the charity before the event. Alopecia UK, a charity dedicated to supporting alopecia suffers, selected Ellie Dennis, Sarah Cotterill and Becky Kerr for a hair loss / semi-permanent eyebrow treatments by Karen. Karen performed the treatments at the event on Saturday,12th September, as part of a live demonstration. Sarah Cotterill was Karen’s second client and thanked Karen for her new eyebrows, which she said were fantastic and pain-free. The third and final client, Becky Kerr, aged 35, was incredibly excited about attending the Big Weekend event, as she had never had the chance to met anyone with alopecia before. Becky was also looking forward to having her eyebrows tattooed by Karen, loving the results and leaving the event happy and confident. Throughout the day, Karen also invited guests to fill out their details and enter into a prize draw for the chance to win a free treatment with one of her Elite Artists. Erin Hughes from Birmingham was the lucky winner, and will shortly receive a free eyebrow or eyeliner treatment. Further details on Erin’s treatment and journey will be available shortly.